Connectivity | A simple tool can make a big impact. A simple tool can make a big impact. This video (shared by George Couros during his talks in Peel) shows how a simple survey tool was used by a teacher to connect personally with her students. It’s a powerful reminder of how important it is to try to meet the students where they are. Sometimes people and especially today’s “screen”agers will share more online than they will in person. After that inital contact, deeper relationships can be forged. It is easy to make a survey in Office 365 like this teacher did in Google Forms. Go to your Skydrive and click +new document. 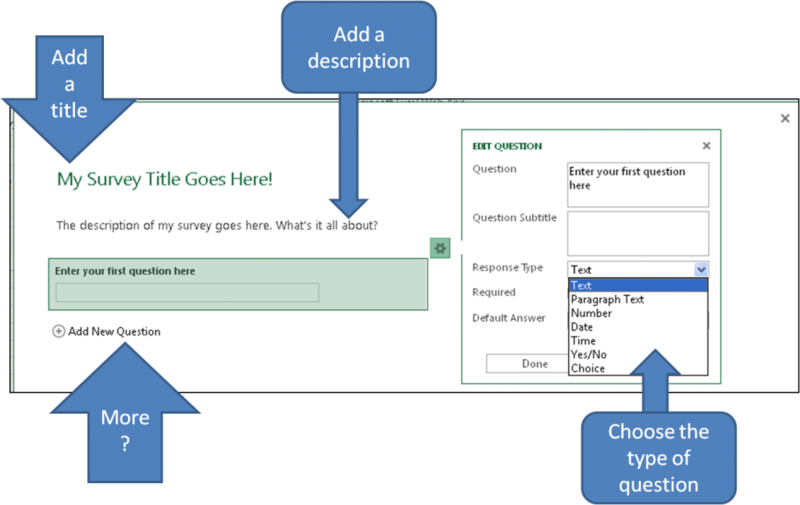 Choose Excel Survey and give it a name. When you are happy with the survey, share it by copying the link provided and emailing the link to respondents or by posting it to your site newsfeed. The results of the survey will be found in the Excel spreadsheet. No one can see the results of the survey unless you share the Excel spreadsheet with them. For everyone who wants to use Google Forms, you can find video instructions here and tutorials here. This entry was posted in Connected Learning, Office 365, PDSB Learning Spaces and tagged Excel Survey. Bookmark the permalink.